Welcome to the "Quick Pay" online bill pay system. You can use this portal for quick access to pay your bill and view statements or account history. This does not give you full patient portal access. In the fields to the right, enter the Patient ID from your statement and the patient's Date of Birth and click the "Sign In" button. 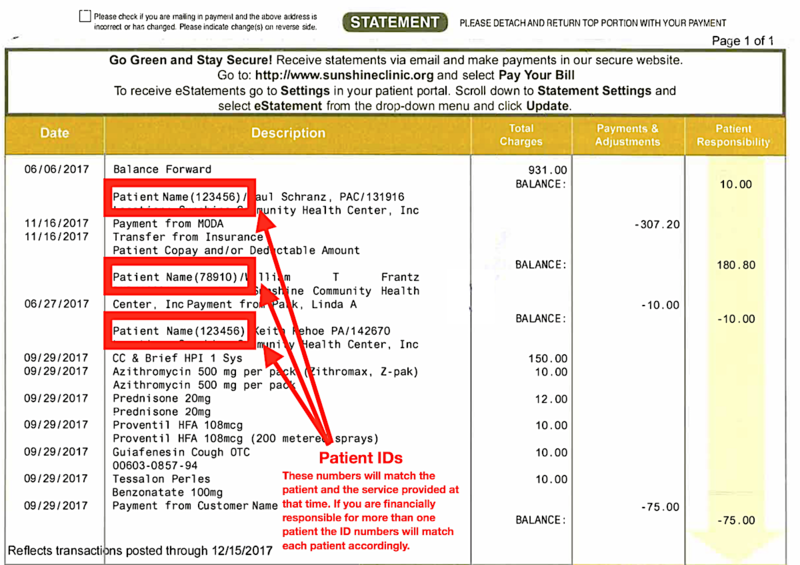 Patient IDs are located on your statement in the description column. They are in parentheses next to the patient's name. Families with more than one patient at Sunshine may have several patients they are financially responsible on their statement. There is a different Patient ID for each patient. If you are financially responsible for more than one patient you may need to enter you Guarantor ID instead. The Guarantor ID is located in a box at the top right of your statement with a due date and amount. Please see the examples below. Click here to Request a Login for full Patient Portal access. Click here to go to the new Patient Portal Homepage. Click here to go to the Sunshine Community Health Center website.